I’m an accessories designer and an online shop owner of *jiu accessories. I was born and raised in Tokyo, and now I’m living in Okinawa. Since I’m quite a new-comer to Okinawa, things I find in Okinawa seem so interesting. So I’d like to write about my favorite places, interesting things and foods, etc... anything I found in Okinawa. 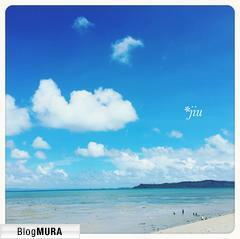 I would be glad if my blog make your Okinawa trip more fun and exciting! A stone-paved road which is said to have been constructed during the 16th centuries. This road was built as part of the main road called ‘Madama-michi’ linking Shuri with the Naha port and the southern side of Okinawa. It has been chosen as one of the 100 best roads to see in Japan. The road used to be about 10 km long, but today only 280m remain in this area. A 280m walk seems quite short, but this path is on a steep slope so I recommend you to wear walking shoes. I took a bus from Naha bus terminal and got off at Shurijo-Minamiguchi stop, and started walking. There are some bus stops near the pavement. However there aren’t many buses on this route, so you should check the best transportation before you go. I started walking from the top of the path. The path is surrounded by trees, and you can hear the wind sigh among the leaves. But beware of Habu (venomous snakes)! I didn’t see them while walking but I saw some signs noticing about Habu. These walls and path were made of Ryukyu limestone. These masonry structures are quite unique. Beautiful flowers grow along the path. These are neatly taken care by residents. In the middle of the path , I found a traditional old house called 《Shuri Kinjocho Muraya》. This space is used as a public hall for town residents, and also it is used as a resting place for visitors. I took some rest and walked all the way through the path. Then I went all the way back to the start. Hiking up the steep stairs was really tough! At the almost top of the path, I discovered a lovely cafe. I stopped for lunch and had the fried noodles in Okinawan style. It was tasty! The view from the terrace was so beautiful. I also enjoyed talking with the people who served me. They were so kind and friendly! Great place to get relaxed with the afternoon breeze. It was a nice walk (and a pretty good exercise). I felt the traditional atmosphere of Okinawa. Watching red tile roof houses and various types of Shisa (lion shaped ornament) were so interesting. If you’re interested in ancient Okinawa, you’d definitely like to visit here!